The golden arches on Golden Gate. In San Francisco 2015, where anything artisan is revered and real estate is surreal, it’s no surprise that fast food restaurants are shutting their doors. But I still felt a wave of nostalgia when I discovered that this McDonald’s had closed. It had been years (decades!) since I’d been inside this particular Mickey D’s, but in my younger years this particular McDonald’s was associated with special times and treats. In the early 1980s, an upscale diner—Max’s Opera Cafe—opened directly across the street from this McDonald’s location. When I was older and independently mobile, I ate many meals with my dad there. By the time I was in my twenties, I enjoyed more variety in the kind of food I ordered and Max’s definitely provided that—in humungous portions. Being more diet-conscious now, I didn’t always order a burger paired with a milkshake but it was nice to know I had the option of reverting back to my childhood menu preferences. 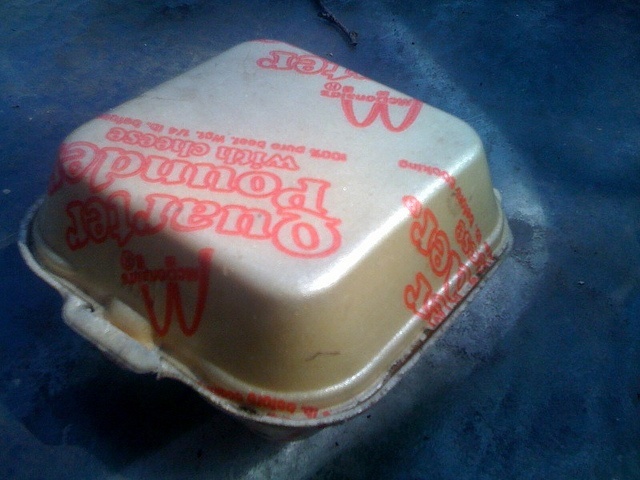 A Quarter Pounder in its 80s styrofam package glory. This McDonald’s also featured in other fun food occasions. A few times a year, St. Brigid’s school offered a McDonald’s meal day. We didn’t have a cafeteria so this was a welcome departure from our ubiquitous bag lunches. We’d sign up and pay in advance and then eagerly wait for the special lunch date. The smell of the burgers steaming in their styrofoam containers wafted down the halls in advance of their delivery to our classrooms. The orders were always the same: a Quarter Pounder (with or without cheese), fries, and a soda. Since they didn’t offer shakes, mom allowed me to sugar-splurge with an “orange drink.”(Coke was absolutely verboten.) One time our McDonald’s Day coincided with St. Patrick’s Day so we had the option of getting their green milkshakes. But if chocolate wasn’t involved, I wasn’t interested (some things never change). As an adolescent, I still indulged in fast food semi-regularly. My high school boyfriend preferred Burger King, but when I was on my own, I was a McDonald’s gal. One solo visit to this location stands out because it helped buffer a traumatic hair experience. In eighth grade I made the bad decision to try a home permanent on top of aggressive, non-professional bleaching. The hair on the crown of my head broke off, leaving an inch of fuzz surrounded by longer, fried-out strands and bangs. It was a terrible blow for my early teen ego and the principal at St. Brigid called me in to scream at me, accusing me of a deliberately executed “punk rocker” fashion statement. After a few months later, a woman taking my order at this same McDonald’s on Van Ness shockingly complimented my “cool hairstyle.” She gave me a glimmer of hope that I might be starting high school with hair that seemed edgy and cool and not horribly tragic. Mac Sabbath serve up “Drive Thru Metal” and the finest Sabbath parody jams. The golden arches on Golden Gate lost their glory long ago. As with much of San Francisco’s Civic Center area, the locale became increasingly more run-down in the last couple of decades. 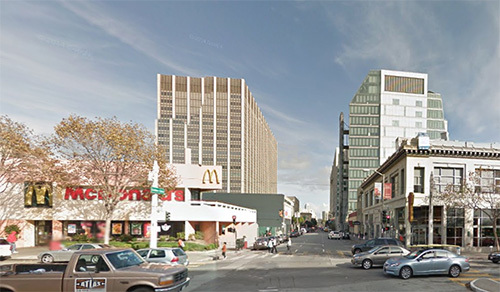 In recent years, my main association with this McDonald’s was making sure to walk on the opposite side of Van Ness at night since it was a poorly lit block with lots of urban camping action. I don’t lament its passing since I am far more likely to enjoy Mac Sabbath than a Big Mac these days. I hope it might be replaced with something other than luxury condominiums (maybe actually affordable apartments?) but that would be as likely as McDonald’ s offering shakes made with organic milk, gourmet chocolate, and locally-sourced strawberries. BRAVO, BRAVO, a colorfully rendered walk down a memory lane of time long past but joyfully remembered. Ahhh the memories, we had some good times and I loved how you eagerly joined me in deciphering Tom Waits lyrics at 8 or 10 years of age. Always up for an adventure ! I’d love to see a photo of your punk hair!! I would have been jealous cause I couldn’t get my hair to spike. I will dig out an old photo and bring it to a future uke jam. My hair was too flat and straight for any real styling too. The trick is totally destroying it–then you get plenty of texture. Love the humor in this! I too would love a visual of the perm on top of bleaching. As I read, I remembered my own childhood relationship with McDonald’s (including a stint of every day during third grade when we lived in a hotel). Thanks for a great post! I’m glad that my horrific hair incident added to the story, even though not specifically food-related.